The life story of a pressurized man in a pressurized society inside the life story of a real man within a real society. Doesn’t make much sense does it? The concept of this game is enough to drive any rational person insane but the engaging and interactive gameplay makes up for all the confusion and insanity. 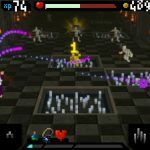 If you are not hooked yet, get started with Dandy Dungeon: The Legend of Brave Yamada right now and experience a gaming universe unlike anything you expect to see. Dandy Dungeon is available to download and play for free on iOS devices from the Apple iTunes App Store as well as on Android devices through the Google Play Store. 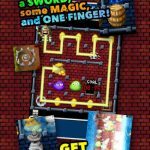 The iconic game is a fan favorite of gamers and critics alike and the developers always take special care to modify and introduce new features into Dandy Dungeon in order to keep all players happy and the satisfaction level higher than before. If you have played dungeon exploration or strategy games before, the main gameplay style of Dandy Dungeon is somewhat quite similar but its special attraction lies within the story behind the game which is also the story of the main character in the game. In fact the first thing that you will notice about Dandy Dungeon is the unconventional and out of the box thinking of the maker of this game which makes this game a truly unique title as compared to other dungeon exploration games in the same category available both on iOS and Android devices. You play as the character of Yamada Kun who is extremely bored of his routine office job as a lead programmer in a famous software house. Tired of doing the same things day in and day out he finally decides to create his own game about his own life and all the hurdles he has faced till now and all the things that he is scared of. As the player, he asks you to help him in his quest to create the perfect game. Dandy Dungeon is a game that is developed from a very unique perspective and as such it is very hard to determine how difficult it might seem to some players while being very easy to play and understand for other players. Not having a fixed learning curve throughout the game is how the game randomizes experiences for each player and adds a surprising element to the game. 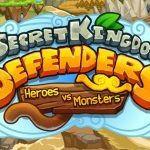 Needless to say the higher levels of this game will push you to the point where you will definitely external help and this guide will ensure that you do not get stuck at any level during your progression to becoming the legendary brave Yamada! The story of Brave Yamada by Yamada in the game starts as a knight in shining armor and your main objective is to fight your way through dungeons battling monsters and collecting treasures. As Brave Yamada, your character will automatically fight with all the monsters in your path and all you have to worry about is selecting the best path for Yamada which promises the least loss of health while allowing you to collect all the treasures as well. This path might be the only visible way during earlier levels but as you progress to higher stages, you will be faced with many choices and your decision about which path to take will play a huge impact on your survival and the amount of gold that you will gain as a reward for successfully completing the level. The game mechanics work by punishing you for choosing the easiest path with the least amount of monsters and hurdles. Every time you choose the shortest available path to the end gate, your remaining health at the the end of the level gets deducted by -1 for each box or monster tile that you missed during Yamada’s journey through the dungeon floor. This may not seem like a lot but when you progress to higher levels, some paths will be available to you which will be as short as possible but still contain monsters in your way. When you battle these monsters you will always lose a percentage of your health which mostly depends upon the intensity and difficulty level of the dungeon floor that you are currently on. Therefore there might exist such situations where you will have very low health when you finally make it to the gate regardless of following the easiest path and as a result you will not be able to progress to the next level because the deduction from your health at the end of the level will cause Yamada to die at the end even though he conquered all the monsters and collected all treasures in his path. Treasures in Dandy Dungeon: The Legend of Brave Yamada hold special significance because they can help you in real time while you are progressing through a certain dungeon or give you certain items or experience (XP) which you can be utilised later on in the game. There are no set rules or a defined pattern which dictates what kind of items or skills you might receive from collecting a treasure but rest assured that doing all the hard work for getting to a treasure will always be well worth it even though you may feel sceptical about this strategy at first. In fact the primary factor upon which you decide the best path for brave Yamada should be based upon how many treasures you are able to collect along the way without dying if not all of them. Some of the higher dungeon floors will make it impossible for you to collect all the treasures lying scattered around in the dungeon as there might be too many monsters or hurdles for you to manage this task effectively. In such situations your best option is to use the path where you will be able to pick up the most treasures while compromising on some because collecting maximum treasures will ensure that you definitely survive at the end and progress to the next level. 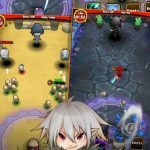 Dandy Dungeon: The Legend Of Brave Yamada has one of the most unique storylines among simple dungeon exploration games and you will find that this out of the box and engaging story is what keeps you hooked to the game so much so that you will find it hard to put your smartphone down even after playing for hours on end. Apart from the story, there isn’t much of a very engaging gameplay so the best way to ensure that you succeed on every dungeon floor and quickly progress to the higher levels is to dive deep into the story of the game so that you start to feel a strong connection with the character Yamada even though you do not have any way to influence the decisions that he makes within Dandy Dungeon: The Legend Of Brave Yamada. Regardless of your experience playing dungeon exploration games before, you will find yourself completely absorbed and at times even laughing out of control at the snippets of humor that the developers of this game have introduced into the character of Brave Yamada. When the game starts, you meet Yamada Kun on the screen of your smartphone in a very pixelated form with a crisp suit on. This first contact might lead you to believe that this Is yet another boring role playing real life simulation game which will reward you based upon the daily life tasks that you perform using your character in the game. However this misconception changes as soon as Brave Yamada flings his suit across the room and immediately sits down on the computer in the center of his bedroom while speaking gibberish all the time. The game is based upon a Japanese character so English subtitles have been provided by the developer keeping in mind players of all demographics around the world. If you want to have a laugh keep the volume up because Yamada repeats the same sounds over and over again but the change of expression that comes with his dialogue delivery makes for a truly humourous and thoroughly enjoyable experience. You can always mute the game if you feel the constant bickering between Yamada and his office colleague is going to be an issue because listening to the same vocals again and again does tend to get on your nerves after a while. Will you be able to save the Princess and find the love of your life or will you perish in the quest for survival? This would be our second guide for Dandy Dungeon. In case you need more tips and tricks for the game, be sure to check out our previous Dandy Dungeon strategy guide!